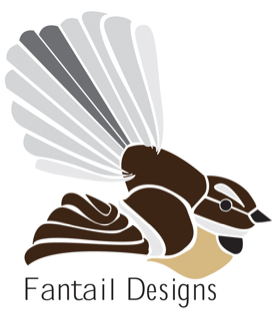 Fantail Designs: What's with the bird? Assuming that I've managed to not be technologically useless, you'll see a bird in my header. It's a fantail, like the blog name. State the obvious, why not. It's a NZ native bird, that hangs out in the leafy part of trees and flits about. It really does fan it's tail out like that when it flies. There's nothing particularly deep or poignant about why I have the fantail, I just really like it. I do like having a NZ native hanging out up there, identity and all that. I had this idea that it would be fun to start an etsy shop and sell things I'd made. It's not really, and in the end I took it down, which was not really a huge loss for the online handmade community, there were only a couple items, and I decided it was more rewarding to just gift them. Baby quilts mostly, and people love getting a quilt when they get a quilt for their small baby, that I decided that was a better reward. But what I am toying with is the idea of getting some labels printed with that logo, to add to items I've made.